From our extensive survey (sample size of three!) you’re either a laundry person or you’re not. I’m a laundry person, Erin’s a laundry person... Lana is not. She’s a workaholic (just not the domestic type!) so in her forever home she used the space that could have been a big laundry as a butler’s office instead #eachtotheirown. 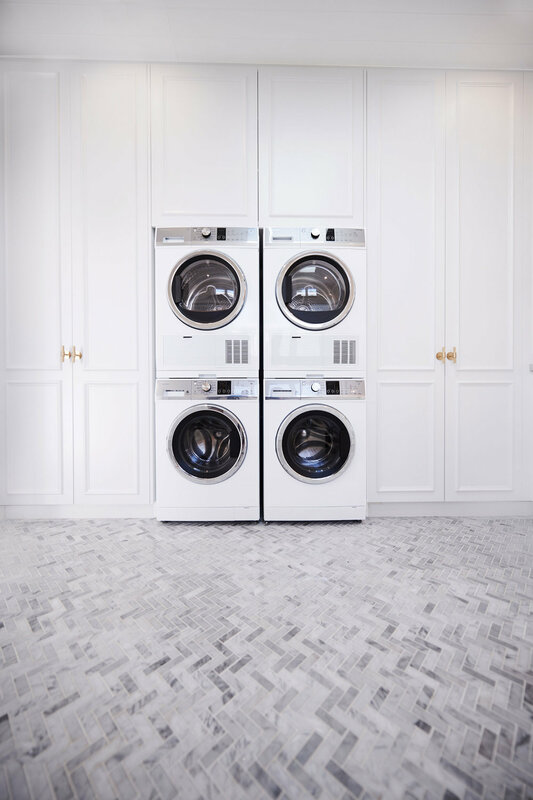 Since it’s unlikely that any of my family are going to willingly use this room, my dream laundry is one I designed for the person who is in it the most – ME! I’ve gone to town in this room – there are tiles galore, loads of appliances, a heartfelt relic from a previous reno, a view of a courtyard – heck, there’s even a dog bath! 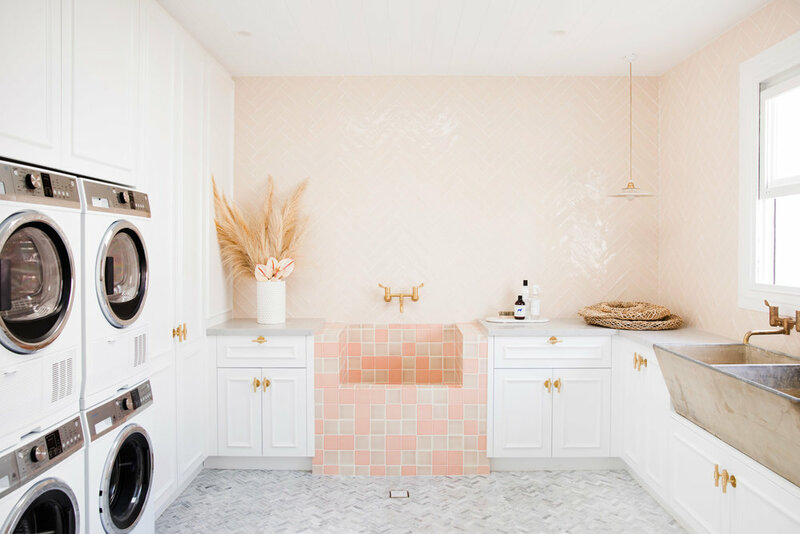 Of course, this won’t suit everyone’s laundry needs and I wouldn’t be suggesting this for a house flip or a client’s home, but my OTT laundry suits me to the tee. 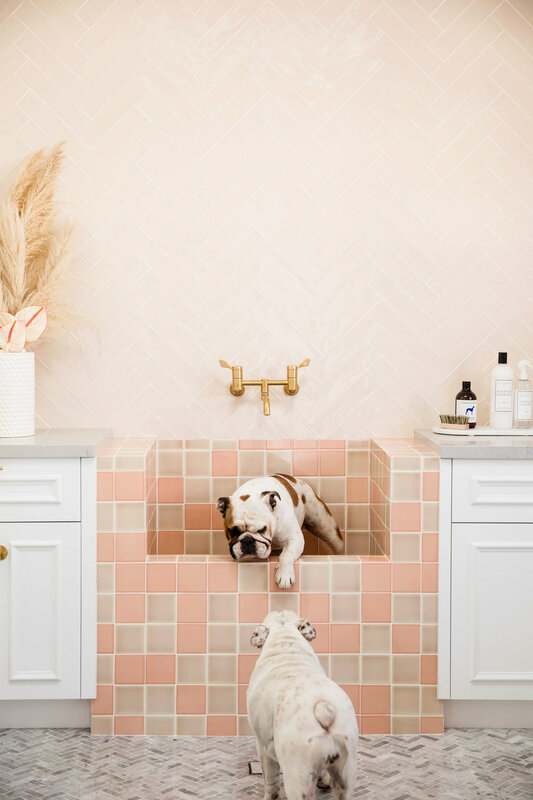 Laundries are considered wet spaces so tiles are a great choice of flooring for this room. Also, for splashbacks, skirting and full walls too– your imagination (and budget!) is the only limit. 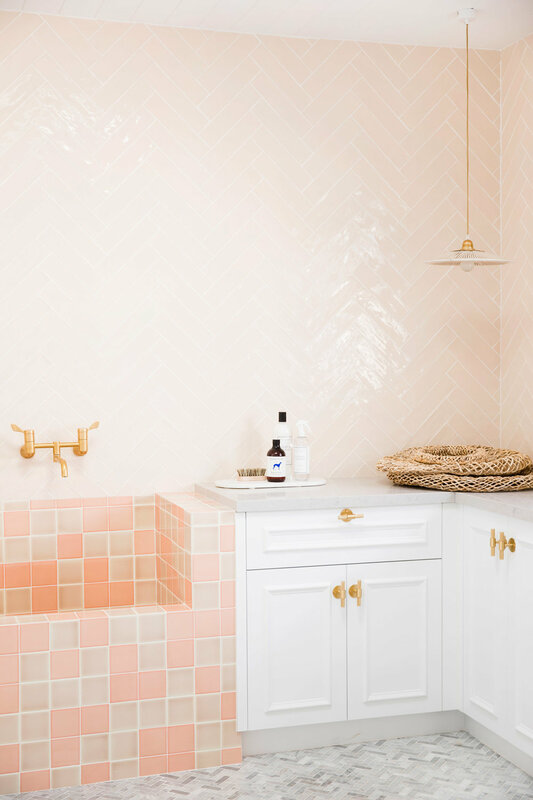 Don’t feel you need to match laundry tiles to the bathroom floor tiles in the rest of the house. A laundry is a discreet zone where we like to have a bit of fun and try something different. I used three different shaped tiles in four different colours in my laundry. Disclaimer: Don’t forget your vision boards! When I say try something different I’m not talking mixing Hamptons with retro – the result may not be the look you’re after. But go to town mixing up colours, shapes and patterns within your overall vision. If you’re unsure how to build a vision board, we teach you in The Reno School. I’ve always thought that doubling up on appliances would be way more efficient in helping me conquer Mount Washmore every day. It’s not for everyone, but I’ve gone with two Fisher & Paykel washing machines and two dryers, so that I can have multiple loads going at once. And OMG, what a difference it makes! It’s like I’ve got my own laundromat in my home #anotherloadbitesthedust. I love a front loader washing machine. The fact that they stack is such a good space saving feature. And they’re easy on the eye, which you know is very important to me 😉. Of all the rooms in the house, the laundry probably needs ventilation the most. Good airflow will help keep it free from dreaded moisture and mould. An external window or door works best – especially a window that can be locked open while you are out. Flood your laundry people ... with light, not water! In my dream laundry I’ve got windows above the sink that open out towards the courtyard. Not only do they provide great ventilation, I get a great view while I’m attacking stains in the sink and they help make this room one of the lightest and brightest in the house. I’ve also got a large skylight smack bang in the centre of the ceiling - geez it makes a difference. Just a quick reminder that you get what you pay for with tapware. 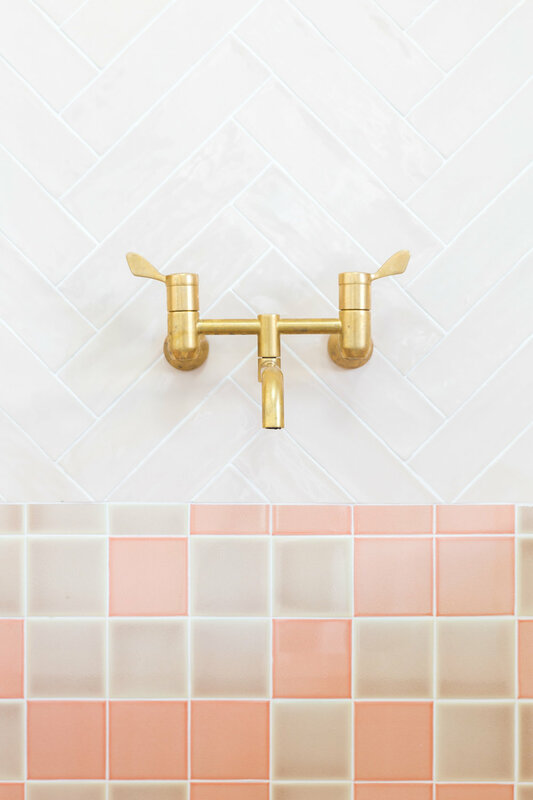 If your taps are wall-mounted (which we love in a laundry), a cheap tap that requires a repair job down the track will spoil your splashback and wall linings. Getting enough storage and bench space is often easier said than done. Once you add a washing machine, dryer and sink (and maybe even a dog-washing tub!) to your layout, you may not end up with as much as you’d planned. Lots of cupboards are essential, both under and above counter #moreismore. P.S - Washing powder and stain remover don’t make the prettiest accessories and your laundry will look so much better if they’re stored out of sight. The sink in my laundry is actually salvaged from our House 5 flip. It’s a double trough and I knew it would fit perfectly in this space. It reminds me of a heartbreaking time in my life but it’s so lovely to have this emotional connection in my dream home. The back story is hard for me to put into writing, but you can watch me explain it here. Sam has a special place in my heart and now my house too. Remember, a laundry needs to be practical but it should also be a place that makes you feel good too. 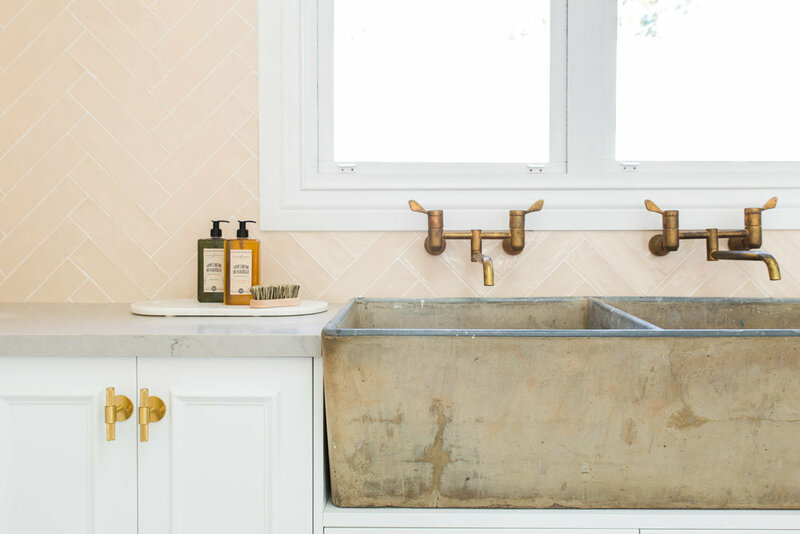 It really could be a life changer to offset your mundane daily chores. P.S IF YOU MISSED THIS WEEK'S EPISODE, HIT PLAY BELOW.